He's back and creepier than ever! It was revealed today that fan favorite Voldo will be returning to the stage in Soulcalibur VI with his signature style and maniacal move sets. For those who don’t know Voldo, he’s been in Soulcalibur for a long time, resurfacing for every installment up until this point. Voldo plays the right hand man of Vercci, AKA “Merchant of Death”, an arms dealer. Voldo was taken to protect the Vercci’s Money Pit, were all his treasures were kept after he died. After many years in the Money Pit, Voldo eventually lost his sense of sight, which in turn heightened his senses of hearing and awareness, making him a major threat to anyone who dared enter the Money Pit in search of treasure. 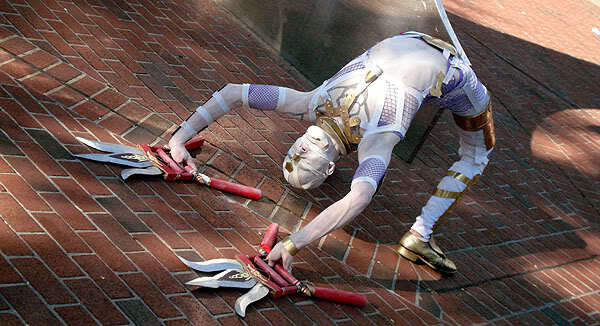 In terms of his combat style, Voldo contorts his body in the most unnatural of ways and even has the ability to attack backwards, which makes him super unpredictable and deadly. Both new and old fans will enjoy his exotic moves in battle. Next articleAcer Celebrates #AcerDay With a Loud Musical Bang – And This Is Just the Beginning!